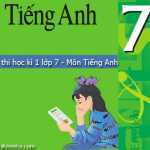 [Tiếng Anh 6] Đề thi học kì 1 môn Anh lớp 6 có đáp án của Trường THCS Bình Giang – Phòng GD & ĐT Hòn Đất năm học 2015 – 2016. A: Excuse me. Where is the (1)………………………….? B: Go to (2)……………………………… of this street. It’s on your right. A: And where is the lower (3)…………………………. school? B: It’s in (4)……………………… street. Take the (5)………………… right and it’s on your left. A: Great! Where can I have some coffee? B: “Quynh” Café is Tran Quang Dieu Street is a good one. A: How can I (6)………………………….. there? B: First turn left, then turn right. Go straight. It’s on your left. A: How about an (7)……………………… gallery? First take the (8)…………………….. left, then go to the end of Le Loi Street, and it’s on your right. 1. Tet is the ……………….time of the year. 3. Today I………………… introduce some natural wonders of the world to you. Ha Long Bay is in Quang Ninh Province. It has many islands and caves. The islands are named after things around us! In the bay you can find Rooster and Hen Island (Trong Mai Island) and even Man’s head Island (Dau Nguoi Island). You must take a boat ride around the islands – it’s essential! Tuan Chau is the biggest island in Ha Long Bay. There you can enjoy great Vietnamese seafood. You can watch traditional dance. You can join exciting activities. Ha Long Bay is Vietnam’s most beautiful natural wonder. 1. In Ha Long Bay, some of the islands look like people or animals. 2. Boat rides around the bay are not much fun. 3. Ha Long Bay is the number one natural wonder in Viet Nam. 4. The seafood in Ha Long Bay is not good. 1. Where is Ha Long Bay? 2. What can you do in Tuan Chau island? 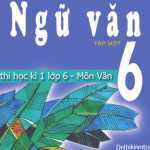 -> Ho Chi Minh City is………………………………………………………..
1. Ha Long Bay is in Quang Ninh Province. 2. You can watch traditional dance. You can enjoy exciting activities. 2. Red River is shorter than Mekong River.